THD Sentient is an all-capitals type family in four weights, designed by Tim Hutchinson in collaboration with MuirMcNeil. It was originally created in 2017 in a single weight for ‘Beyond 2001: New Horizons’, a celebration of the 10th anniversary of the Stanley Kubrick archive at the London College of Communication. Hutchinson based THD Sentient’s characters on the forms of numerals used to display telemetric data on the screen of HAL 9000, the intelligent computer that controls the systems of the Discovery One spacecraft in Kubrick’s 2001: A Space Odyssey. 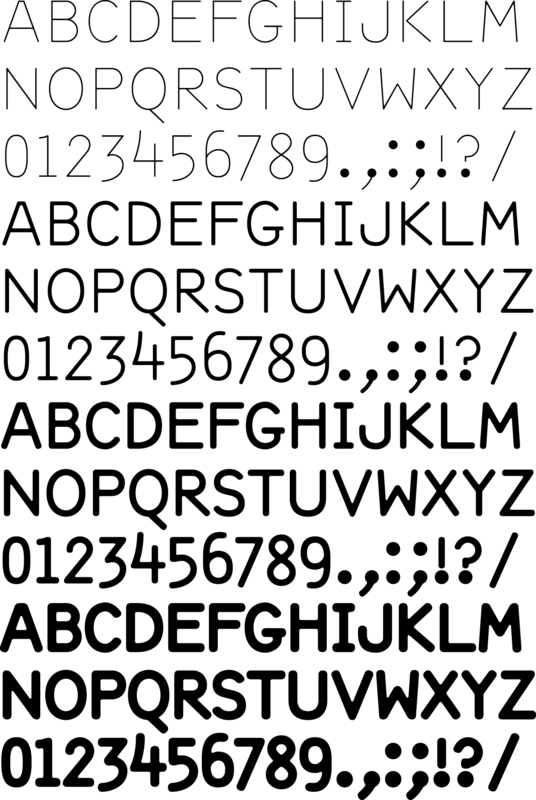 These characters were re-appropriated from an original typewriter font created for the IBM Selectric II System at two fixed sizes specifically for financial settings. Although Kubrick’s meticulous research and attention to detail in his films are known to extend to the minutiae of letterforms, whether he was directly involved in the implementation of HAL’s display has not been established. However, it is evident that HAL’s designer enlisted the IBM numerals more for their subtle evocation of an otherworldly computer language than for any technological accuracy. THD Sentient is an interpretation of these forms that has been rationalised by MuirMcNeil and extended into a fully-functional Latin-1 character set in capitals only. Monolinear, proportionally spaced and cut in four weights on matching bodies that occupy precisely the same spaces across the range, it is available in OpenType for Macintosh.